Why do I have to make things so complicated? Charlie Kaufman has spent the last decade penning some of the most esoteric films to ever emerge from Hollywood. He has repeatedly demonstrated his ability to take unusual ideas (Being John Malkovich), obtuse ideas (Eternal Sunshine of the Spotless Mind) and unfilmable ideas (Adaptation) and making them funny, insightful and accessible to a mainstream audience but which somehow remain intelligent and provocative. 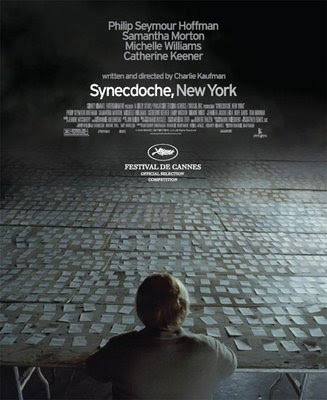 Synecdoche (Si-NECK-doh-kee), New York, his debut as director, further demonstrates his strengths as a writer, but suggests that up to now his skill has been as a collaborator, rather than a singular talent. The story follows Caden Cotard (Philip Seymour Hoffman), a theatre director who lives in Schenectady, New York. Despite the acclaim that his work has received, Caden feels that his work lacks 'truth', and this forms part of the general malaise of his life; he is in a loveless marriage, he may be dying from a non-specific disease, and everywhere he looks he sees signs of his mortality. Then, Caden receives a grant to do whatever he wants and he begins a grand project; to build a scale-replica of New York in a large warehouse and populate it with actors. Let's get the following out of the way; the acting in Synecdoche, New York is, across the board, wonderful. Philip Seymour Hoffman, despite playing a rather unlikeable character, is magnetic, and the largely female supporting cast that mill around Caden Cotard are all on top form. Samantha Morton, in particular, is heartbreaking as a woman that Caden pursues over a number of years, and the chemistry that exists between the two of them provides a solid basis for the rest of the film to revolve around. It has one of the best ensemble casts I've ever seen in a film. In comparing Synecdoche, New York with his other work, the first thing that you notice is that it is the most dreamlike film that Charlie Kaufman has been involved with. The other films he has written have been tales of extraordinary occurrences in otherwise realistic worlds (in fact, it's strange to think that Michel Gondry, whose work has since traveled down a path of unfettered whimsy, should have been the director to create the most realistic world within which to set one of Kaufman's scripts). Synecdoche, by comparison, is a film that exists in a world every bit as strange and dreamlike as the central premise. The film feels very much like a dream that the audience has somehow stumbled into. Unfortunately, this somnambulist atmosphere extends to most aspects of the film. The first hour moves at such a languid pace that it almost lulls you to sleep by the time it gets to the warehouse. Kaufman spends such a long time describing how depressing and empty Caden's life is that the film ends up feeling depressing and empty. I couldn't help but think that if Spike Jonze had directed the film, as was originally intended, he would have got to the warehouse much quicker and the funny, interesting part of the film would have arrived much more quickly. For the problem with Synecdoche is that it is so slow and digressive that it loses focus; its themes and ideas are so big and dense, yet the execution is so distracted and diffuse that the film loses sight of what its actually about. It is about death, dating, everything, but too often it wanders off and becomes about nothing. It would be very easy to write Synecdoche, New York off as the indulgence of a first-time director with too much freedom. It's almost tempting to say that it is, in that least descriptive and unhelpful of terms, a mess. And yet the insights that the film has about death, dating and everything are so powerful, and the flashes of genius that break through the murk are so blindingly bright that I can never discount it. It's a mess, it's self-indulgent, it's too long, but it is about something, it has something to say and it does so with conviction. When it finally reveals itself and divulges what its message is, it almost absolves it of all the problems that previously plagued it. Almost. Synecdoche, New York is a film that will divide people. You will either discount it completely, or it will stay with you. You may even think it's a masterpiece. I don't think it is, but there is the shadow of a masterpiece there.